The Canadian Association of Insolvency and Restructuring Professionals (CAIRP) is the national professional organization representing more than 980 members working in the insolvency system, as well as over 500 articling, life and corporate associates. 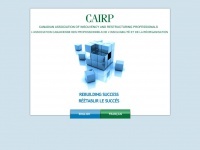 Almost ninety percent of trustees licensed under Canada's Bankruptcy and Insolvency Act are members of CAIRP. CAIRP was created as a non-profit corporation in 1979 to advocate a fair, transparent, and effective system of insolvency/restructuring administra ..
three profiles were found for Cairp.ca in social networks. Among other social networks the website is represented in Facebook, Twitter and LinkedIn. The web server with the IP-address 137.135.91.176 used by Cairp.ca is run by Microsoft Hosting and is located in USA. On this web server 20 other websites are hosted. The language of those websites is mostly english. A Microsoft-IIS server hosts the websites of Cairp.ca. The website uses the latest markup standard HTML 5. The website does not specify details about the inclusion of its content in search engines. For this reason the content will be included by search engines.